A contingent of Harker students had the unique opportunity to hear six-time Olympic medalist, motivational speaker and foundation founder Jackie Joyner-Kersee give the keynote address at this year’s local YWCA luncheon. A longtime supporter of the YWCA of Silicon Valley’s annual luncheon event, Harker has regularly hosted a table for upper school students who have a special passion for that year’s topic. As one of the most decorated female athletes of all time, Joyner-Kersee serves as a role model for girls and women alike. She dominated the track and field circuit for 13 years and won three gold, one silver and two bronze medals, spanning four Olympic games during her illustrious career. The YWCA’s 21st annual luncheon was held in October at the Santa Clara Convention Center, with event proceeds supporting the group’s much lauded services. Each year, more than 40 companies and hundreds of individuals sponsor the YWCA’s luncheon. Past speakers have included Isabelle Allende, Gloria Steinem, Sally Ride, Janet Reno and Mary Lou Retton. Next year’s keynote address with Dr. Jane Goodall is anticipated to draw a sell-out crowd. 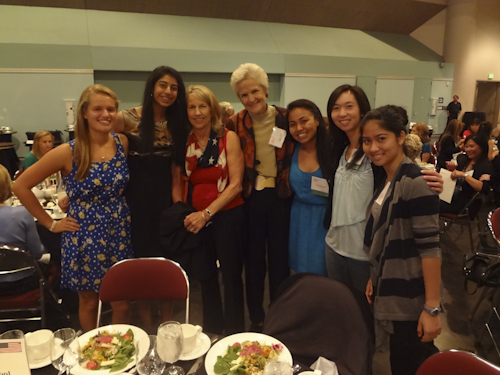 Harker students this year had the good fortune to meet with former Olympic medalists Anne Warner Cribbs and Marilyn King, who were special guests at the event. Cribbs won a gold medal for swimming and King was a two-time Olympian in the grueling five event Pentathlon. The mission of the YWCA is to empower women, children and families, and to eliminate racism, hatred and prejudice. The organization provides programs in the areas of sexual assault intervention and prevention, counseling services, domestic violence, child care, youth programs, family services, and social and racial justice. The YWCA serves nearly 18,000 Santa Clara County residents each year, and has provided services across the county for more than 100 years. More information can be found at www.ywca-sv.org.